Three years ago, Kersey Sturdivant and myself launched an ambitious crowdfunding project–the OpenCTD–with the plan to produce a low-cost, open-source CTD for thousands of dollars less than the commercial alternative. That campaign fizzled, bringing in barely 60% of our target goal. After taxes and fees, that amounted to about $3500 available to us to play around with. The OpenCTD wasn’t dead, but it was on life support. We had a vision: to make to tools of oceanography accessible to the widest range of people, not just ocean researchers, but citizen scientists, boat-owners, fishermen, surfers, swimmers, any one who enjoyed the ocean and wanted to better understand their local waterways. The OpenCTD was ambitious, not only in its scope, but also in our ignorance of the knowledge required to achieve that goal. In the three years since, I moved to California (and then moved back East) to meet with some of the best underwater engineers in the open-source movement. We added Russell Neches, an experienced hardware hacker to our team. We partnered with OpenROV to learn from their vast experience. And I’ve spent the time re-skilling: learning to code, design and fabricate 3D printable materials, build electronic components from the ground up, and manage an open-source project. Along the way, as many long time readers have noted, we’ve added some new tools to our repertoire: a 3D-printable Niskin bottle for water quality sampling and a tough-as-nails field computer for basic data entry. All of which we needed in order to develop the skills necessary to create the OpenCTD. 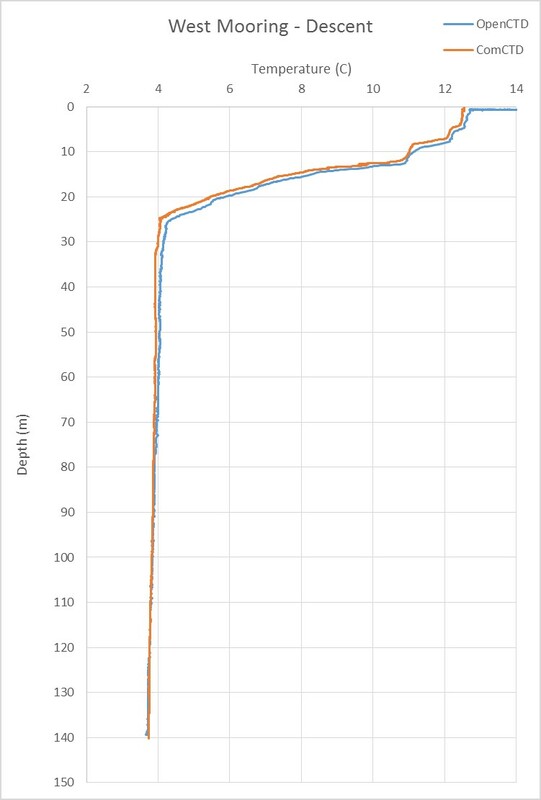 Comparison between an OpenCTD and a commercial CTD on a 140 meter dive. But that’s not all. As we slowly built and improved our devices, we realized that we had something much bigger than a low-cost oceanographic tool. During this time, e-mail poured in from around the world, underfunded researchers looking for ways to continue their long-term studies, citizen science groups wanting to add their own marine monitoring stations, fishermen who wanted to know what the water was like near their big catch, and many, many others. We weren’t just building a CTD, we were building a movement. That movement is Oceanography for Everyone. Today, after three years of growth and nearly half a year of direct development, we’re launching the Oceanography for Everyone community portal. Oceanography for Everyone will serve as a central hub for open-source marine science, marine conservation, and oceanography hardware projects, providing a place for all ocean stakeholders interested in sharing, contributing, or just building their own oceanographic hardware. All of these projects depend on community testing and improvement and we’re trying to make it as easy as possible for ocean stakeholders to contribute to ongoing monitoring of our oceans. The Oceanography for Everyone community portal leads to instructions, bills of material, and repositories for each project. These repositories include not just code, but 3D shape files, raw and processed data, and even expedition narratives from each field trial (including both digital and handwritten notes from every deployment). All of which is design to make every project as accessible as possible. The three of us can’t do this all on our own. We need members of the broader ocean science and conservation community, as well as other ocean stakeholders, to contribute by building devices, testing them in the field, and finding their flaws. As the project evolves, we’ll also add the ability to log an access data. What if you’re not an ocean scientist who also happen to be a hardware hacker? Oceanography for Everyone is still for you. Among our many projects is the Citizen Oceanographer’s Toolkit, a list of the essential gear that any excited ocean stakeholder should carry in order to better understand their local water ways (as well as sources to find low-cost options) and instructions on how to use them. We invite anyone with a passion for ocean science to contribute to this currently sparse, but growing guide. Adding your favorite affordable, handheld oceanographic tools is a great way to contribute to Oceanography for Everyone, learn how our repositories work, and join the community. Oceanography for Everyone: Because the ocean belongs to all of us.